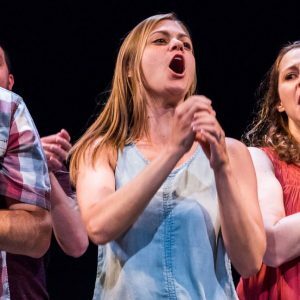 Caroline believes that long-form improvisational comedy is a contemplative practice and she's been drawn to activities that force her into working closely with others in the present moment- from coaching rowing in Ann Arbor to teaching mindfulness to students in Maryland. Caroline has been studying/doing improv for 8 years in Washington, DC. She has taught nearly all the class levels at WIT, was an ensemble member of Commonwealth, director of ensemble Love Onion and coaches practice groups and indie groups around DC. She started classes at the DC Improv with Shawn Westfall and has since performed with the indie team Hot & Sweaty, the WIT Harold team Spirit Bear, the October Issue project, POTUS Among Us 2016 and 2012, 5 FIST teams, multiple Improvapalooza shows, the Del Close Marathon, etc. She brings a strong background in group facilitation as she was a rowing coach, alternative spring break leader, scout troop leader, mindfulness teacher and program manager for college students. She has a master’s degree in Education and a BS in Psychology and isn’t afraid to use it!